Spread plate technique is the method of isolation and enumeration of microorganisms in a mixed culture and distributing it evenly. The technique makes it easier to quantify bacteria in a solution. The spread plate technique involves using a sterilized spreader with a smooth surface made of metal or glass to apply a small amount of bacteria suspended in a solution over a plate. The plate needs to be dry and at room temperature so that the agar can absorb the bacteria more readily. 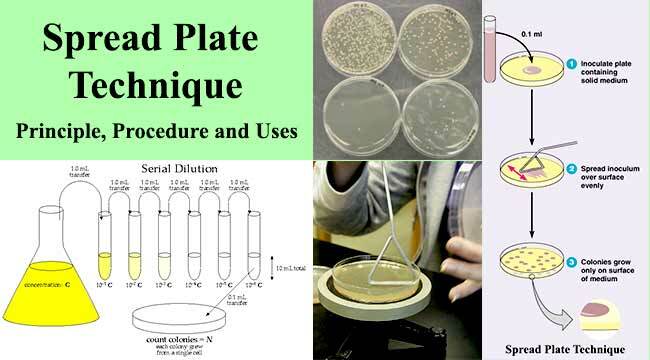 A successful spread plate will have a countable number of isolated bacterial colonies evenly distributed on the plate. It is used for viable plate counts, in which the total number of colony forming units on a single plate is enumerated. It is used to calculate the concentration of cells in the tube from which the sample was plated. Spread plating is routinely used in enrichment, selection, and screening experiments. Strick aerobes are favored while microaerophilic tends to glow slower. Bailey & Scott’s Diagnostic Microbiology. Practical Microbiology. Pradeep Kumar Sharma.